A training manager is responsible to handle all training related plans and developments, so when one goes for the interview of the training manager, he/she should have the detail idea about the methods and techniques of the training program that a company may use for developing its work environment. The interviewer wants to know what the skills you posses to train a team or an individual; behavioral knowledge is important in this field. Here, some possible questions, which can be asked for the post of a training manager interview is given below. 1 Q: What are the qualities a trainer should posses? A: a trainer needs to communicate with a team or rather with an each team member, so a good communication skill is a must-to have quality for a trainer. There are different methods of training so a trainer should be methodical and can also identify which method can work out for a particular situation. Along with this, a trainer must be practical as well as experienced enough to carry out a successful training program. 2 Q: Why a company needs training programs? A: training helps the employees to improve their knowledge and behavioral gestures towards their work. Through a training program, employees learn how to deal with a difficult situation as well as the processes, which the employees can use to extend their knowledge in the respective field of work. A training program team identifies the lacking in the work environment of an organization and plans the training program to overcome such situation. 3 Q: What are the different training methods? A: training methods differ according to its purpose and which method can be applied that should be decided by a training manager. There are on-job and off-job training program that a trainer can use for a specific purpose. The other methods are internship program, case analysis, lectures etc. 4 Q: Explain on-the job and off-job training application. A: on-the job training deals with learning new job role of a company. This training process is necessary at the beginning that explains the responsibilities of a certain job that an employee is going to face. That process makes them understand about the new job. Off-the work training method does not follow the actual work criteria; it is used in a company to develop the skills of an employee through the case study analysis, presentation and lectures. 5 Q: What are the job responsibilities of a training manager in a company? A: a training program is essential to improve the skills of trainees in their specific area of interest, so a training manager has to look after the whole process right from the beginning to the end. Making an effective training plan, scheduling the different training session, selecting the relevant methods, arranging necessary aid, conducting and evaluating the process are essential to maintain for a training manager within a company. Above all, a manager needs to understand the situation first and then acts accordingly. 6 Q: What will be your necessary steps to make a long training session an attractive and energetic? A: when a long training session is needed to be handled, the trainees tend to become bored. A training manager should be tactful enough to convert the environment into an energetic one by incorporating different games and entertainment aids, of course maintaining its purpose. Timely break is necessary to refresh the mood and rather than making the whole session on the lecture basis, use audio-visual aids. 7 Q: What are the criteria of effective job training? A: a training manager uses some techniques to ensure the effectiveness of a training program that include adding new ideas, evaluate those ideas with knowledge and skills, making a practical concept, setting a goal in regards to the company’s achievement and evaluate the program at the end to make sure its effectiveness. 8 Q: What are the processes to get a positive feedback of the trainees? A: whatever your purpose of training is, you need to extend the approach to get the positive result and the summary and storytelling of the complete training process are some options to get back the response. You can make it an interactive session where employees are given tasks to summarize the whole thing. Real life example and the feedback mechanism are also important to get the desired feedback. 9 Q: what are the difficult issues, a training manager faces in conducting a program? A: there are several issues, which can make hindrances in the work of processing training, including poor motivational support of the employees, lacking interest in participation, poor learning quality and others. But, the issues should be carefully handled by the training manager. 10 Q: how you improve your training skill with the present developments? 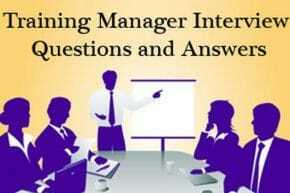 A: as a training manager, you need to be always updated with the recent techniques and plans of the training program that enhances your capability and the source of this is to attaining the seminars, researching on the internet or reading the relevant books.